The biggest piece of equipment in the mechanical room is this Logix24 storage tank. Its multiple inputs allow a variety of connections. Image Credit: David Goodyear The PAW pumping station is the mechanical guts of the system. It will push water from the storage tank to the wood stove and back. The Viega distribution manifolds will route water to the low-temperature panel radiators. The Pside-Kick kit is a cycle stop valve that regulates water flow. The day-to-day operational costs of this building should be less than a code-built home. Lower energy use means lower energy bills. In principle this should lead to simpler mechanical heating systems. 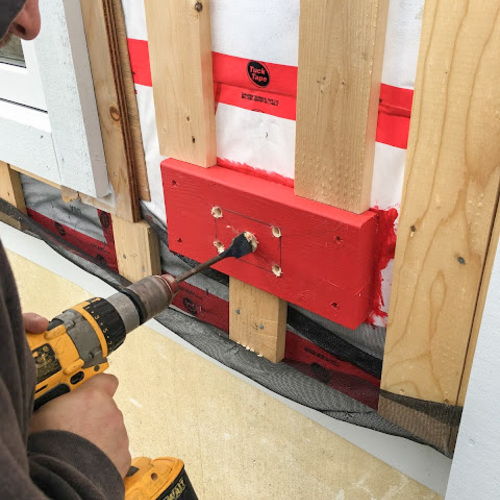 This aspect of Passive House design was always considered to be a way to tunnel through the cost barrier of all the extras, such as triple-glazed windows, high R-value walls, etc. 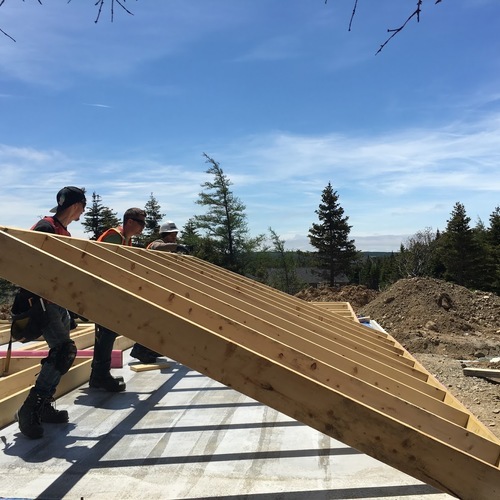 Using photovoltaic panels provides a way to offset some of the source energy requirements of the building, but since net metering wasn’t allowed in the province at the time of my decision, future installation of PV seemed like a pipe dream. With electricity costs rising, using a locally available fuel source could offset some or most of the energy costs associated with being connected to the grid. This could be made possible by targeting the site demand required by heat and hot water. Having a heating source that uses minimal electrical energy would make heat and hot water available during periods of extended power outage. Use a fuel source that would dramatically decrease the source energy requirements of the building. This all added up to “wood.” Wood is available locally, it can be burned to provide massive amounts of heat for both heating and hot water, and it can be used to offset source energy. Living in a province where wood burning is prevalent provides a natural choice. The big problem with a wood stove is that they are too powerful. Finding a stove to meet small heating loads (i.e. less than 5 kW) is not easy. It also is challenging to find a stove with hydronic heating capabilities. 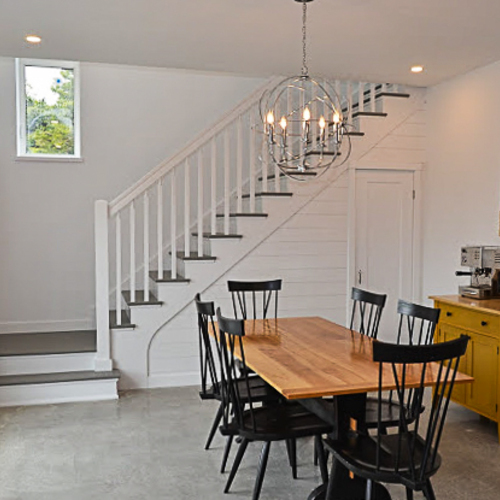 The only wood-fired hydronic stove in Canada for a living room is the Walltherm. While firing, it dumps about 12.7 kW into heating water and only 2.2 kW into space heating. This requires a large thermal storage tank. In my case I opted for the Logix24, which has a solar thermal exchanger built in. Eventually I plan to use a Geyser-R (Nyle Systems) heat pump. That will help supplement hot water production in the summer by running the heat pump through the solar heat exchanger. There are many configuration options with a storage tank like this. It can be used for any type of radiant hydronic system including low temperature radiators, in-floor heat, etc. The connections on the tank also allow for supplementing electric elements. I bought the stove and components seven months ago. I was happy when it was time to install the tank and start arranging the mechanical room. My HVAC contractor, Adam Rickert (Hot Water & Fresh Air Systems), has said multiple times, “Mechanical rooms are too small!” Finally, after months of planning, I believe him. At only 7 feet square, it’s a pretty small room, mainly because the Logix24 tank is so big. The original layout of the mechanical room involved some assumptions that led to some problems. 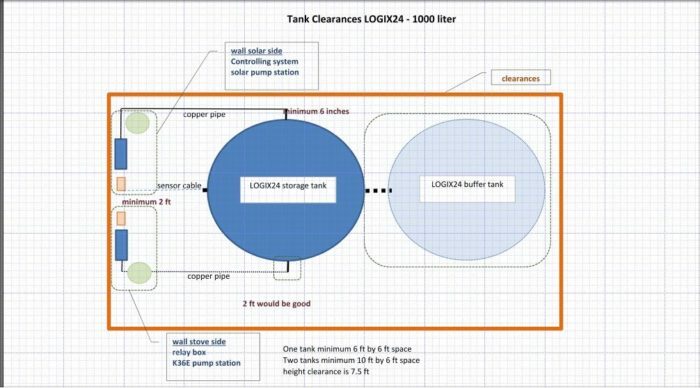 The main assumptions were about the size of the tank and the inputs on the tank. There was no way for the layout to work. It seemed fine during our design stage but once I received the tank, I realized that our plan should have been a little different. The floor drain was not in the ideal position. The HRV would have to be relocated in the room. The well pump pipes are in the wrong place — the list goes on. This being said, I think we found a way to rearrange the room: The thermal store is now at the center of it all. This tank is commanding in every way! It uses almost one-quarter of the floor space in the room but it works! The PAW pumping station is the mechanical guts of the system (see Image #2 below). It will push water from the tank to the stove and back to the return on the tank. The station includes a Grundfos Alpha low-energy pump. It draws between 8 and 45 watts, depending on the setting. I expect it will run somewhere in the middle, at between 30 and 35 watts. The Viega distribution manifolds for the low-temperature panel radiators are also installed (see Image #3 below). The outdoor reset and mixing valve still need to be installed. We are expecting that the outdoor reset setting will be such that the water moving through the distribution system will be about 120°F in the dead of winter. The reset will adjust temperatures accordingly as exterior temperatures get warmer in the spring. The energy-recovery ventilator (the X24 ERV ECM by Venmar) looks like a great machine. It appears to be nicely built and has some decent ventilation features. It is a little on the large side, and because of its size it became a thorn in our initial layout plan. The initial plan was to place the ERV on the exterior wall directly below the Reversomatic dual intake/exhaust duct. Instead, it had to be moved almost 6 feet away from the initial position. This uses about 6 feet of extra duct. 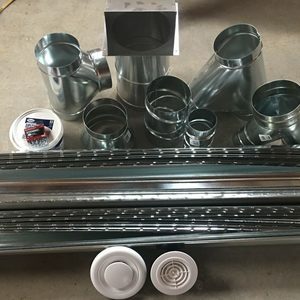 This duct will be cold in the winter and warm in the summer, and therefore there is an energy penalty associated with moving the ERV to the interior of the mechanical room. The penalty is about 127 kWh per year, according to WUFI Passive. Adding another inch of insulation saves about 25 kWh annually, so it’s probably not worth the hassle. As of now, the machine has been running just to help with the moisture load in the building. Once we are ready for diffusers to cap the supply and return ducts, the system will be balanced and the air flow will be matched to the WUFI model. The ERV seems to be behaving as expected. The latent recovery varies but will be around 68% for our setup, according to the Venmar documentation. Altering interior moisture levels is slower than it would be with an HRV, but it is more effective at higher ventilation rates. At maximum, the recovery rate is only 48%. When I purchased the unit I was concerned about the effect of higher interior humidity levels. However, there has been no condensation on the triple-glazed windows with the interior relative humidity hovering around 55%. I toyed with several options for the well tank setup. Around here, people often install a 30-40 gallon tank with a pressure switch that cycles on and off at 40/60 psi. There are advantages and disadvantages for choosing a large tank. One advantage is always having a large water store on hand during times of the year when the water table drops or if the well is simply drilled in a low water table. One disadvantage is, if left uninsulated, all of that cold water in the tank absorbs heat from the house; you dump it down the drain every time you draw from the tank. Another disadvantage is size. In our mechanical room a large tank is not an option. Several of the tradespeople working on the house mentioned a VFD (variable frequency drive). This is a piece of electronics that turns a normal pump into a variable-speed pump. The tank is much smaller and the pump is on demand. The pump speed maintains constant pressure in order to meet that demand. This allows multiple fixtures to be on at the same time. Another option is a CSV (cycle stop valve). The inherent simplicity of this system led me to my final choice: A Pside-Kick kit (see Image #4 below). The valve with this kit maintains a constant pressure to vary the flow rate. This is much better for the pump and just throttles the flow. The pump impeller still turns at the speed it was designed for but moves more or less water and draws more or less power. The benefits over a VFD are described here. I installed the Pside Kick kit along with two sediment filters. As filters clog the resistance to flow increases. A parallel run would provide less resistance to flow than having two filters in series so I plumbed the filters in parallel with the same PEX runs so the static pressure along each of the filter runs would be the same. Ball valve shut-offs were plumbed on either side of the assembly so future servicing would be much easier. The installation is compact and it all fits under the ERV. My electricians pointed out that we can also mount the well motor control and the well disconnect under the ERV in order to keep all the well-related gear in the same place. That is the current state of the mechanical room for now. I am expecting there to be much more progress in the weeks to come! I'm really curious to hear what your experience will be with the cycle stop valve. I've looked at it a couple of times but it seems that all roads lead to bad reviews. On the pro side is the obvious space savings and the reduced cycling which should lead to reduced power consumed during startup and less wear. On the negative side is the higher energy per volume during steady state use and possible increased wear due to lack of cooling. I hadn't considered the energy penalty of the pressure tank heat sinking though, which is stupid seeing as I had to insulate mine to prevent condensation from forming on it. Analyze the difference with a normal pump setup in terms of total energy use. This being said, it’s definitely better than a vfd. "it’s definitely better than a vfd." Oh, for sure. Those are huge power hogs. How long have you been running it? I thought the house was still under construction. When you look at a pump curve, it is easy to see how the clams made for the CSV pan out. Restricting a centrifugal pump reduces the amount of work it's doing, resulting in reduced current draw. I don't think it's a linear relationship, but probably not severe enough to cause overheating issues. When you cover the end of your vacuum hose and stop flow, the vacuum motor speeds up. This happens for the same reason: reduced work being done. The only part of the CSV system I'm not sure about is the tiny pressure tank. I would think sticking with at least a medium sized tank would be beneficial. The smaller the tank the more often the pump will cycle. Taken to the extreme, without a tank the pump will need to start every time a tap is turned on, regardless of the amount of water used. I would think a medium sized tank might be a sweet spot between space allocation and limiting pump cycles? Due to limited floor space we ended up with a wall-mounted 18liter. FlexLite expansion tank. Yes, any but the most trivial uses of water will initiate the well pump, albeit at reduced ooomph. I felt that we could not accommodate a floor mounted tank and did not want the 'modern' VFD as I don't need another miracle tech gizmo that might prove finicky over time. One caveat is that we might expect the Water Heater to dribble at the relief valve due to the small expansion tank. Apparently the bigger diaphragm well tanks provide better buffering for heated water backflows not leading to temporary over-pressure. I never fully grokked the gist of the problem. We won't know how it goes until the system comes online. The reduced power draw as you decrease flow and increase pressure (at the pump) is not at all linear. There is definitely a pump energy efficiency hit when using a CSV. I dislike condensation on pipes and toilets - a little heating of the water in the pressure tank reduces this. I'm assuming the condensation on the pipes and toilets was directed at me..? I agree, wholeheartedly. What do you recommend as a heaters for that situation? There isn't an element port on any pressure tank that I'm aware of. @Calum, Ive been running it now for almost 2 months. We are living in the house now. I fell about 2 months behind on blogging because I was completing alot of the interior work myself. @Kenneth, my CSV came already adjusted so I cant say much about how noisy that process was. I can say that under normal operation the noise level is no different then my previous well tank setup. I really didnt have much space and somebody recommended a VFD. During my online research, I came accross the CSV and realized they are kind of one in the same without all the electronics. I am pleased with the choice. Its worked well so far! Thanks for the mention of the CSV. I had not heard of it and have found the information online quite interesting. The company makes a good case for how it works. I would be curious how you find the energy consumption over time. It looks like the only Canadian source for the Walltherm is in NS? (We are over in BC). How much did you pay for the stove and tank? Thanks for all your work on the blog. I have enjoyed reading it. I have been in contact with Walltherm in Nova Scotia. They sent me a diagram for locating the water storage tank. Did you have a diagram from them? If so, I was wondering why you had issues with your tank location, piping and drain. Can you post a diagram showing your mechanical room layout? I see in the Walltherm info that it comes with a Grundfos pump or a Wilo pump. Have you tested the pumps to see how much energy they draw? 1. If you installed an exterior combustion air channel into the back or bottom of the stove (along with a manually operated damper)? 2. OR did you install the WAL03 control device in order to see the temperatures of the storage tank, heat exchanger, operating hours, temperature of the flue gas as well as the “Alarm Function” (to know whether or not the Air Flap is open or closed) right in your living room? 3. Interestingly, there are a number of things mentioned in a previous version of the Operating Manual (version 13) that don’t seem to be in version 15. For example, version 13 states that: “The channel for the external (combustion) air is connected from under the stove or from the backside. That air enters the lower part of the stove. From there the air exits (into the room). If you add the (lateral) cap (not included with the stove) the air is then channeled from the lower part of the stove into the main air inlet on the right side.” Did your stove come with a “lateral cap”, did you order one or has the stove design changed so that you no longer need one? 4. In version 13 they recommend installing an “emptying tap” at the lowest point in the system. They also state: “If you have installed a circulation pump for the hot water in your system, it is recommended to switch the pump off at night (automatically). To control the pump with a “flussostat” would be even better”? Did you do these things? These all seem to be important points, and yet I can’t find them in later literature. Another interesting thing about version 13 is that they include 2 descriptions of safety features such as a “safety thermostat for control of the combustion air intake” (photo 3) and a “thermal safety drain” (Photo 4), for both of which you have to “consult a separate manual for correct adjustment of these safety functions.” Did you get instructions on how to do this? As to my own concerns, could the Grundfos Alpha 1 pump be changed for an El Sid circulation pump (I’ve read that the El Sid pumps are much more energy efficient)? Could you have changed all the piping to the European standard so you wouldn’t have to use “dowdy seals”? You mentioned that you used the Excel UltraBlack stovepipe for the Walltherm. What model of chimney did you use? What brand/model of TRV did you use? All in all you’ve added several components to the Walltherm system, such as the Taco iSeries 3 way mixing valve, the Taco ECM pump, the Pside-Kick kit, a Veiga distribution manifold, sediment filters, ball valves, etc. Could you write a bit more about why you had to add all those extra components? How did you know you needed them? Finally, are there any other components that you added to the Walltherm system that you haven’t mentioned? Scott, Ill try my best to answer everything. We did measure the energy of the pumps. I think the Taco constant pressure pump (veridian 1816 ECM pump) measured in around 23 W when the zones are fully open, and the Grundfos was somewhere around 18 W. My Grundfos is set on constant speed #2 and moves about 3 GPM when the stove is operational. I will try to upload a layout diagram if I get a chance. We looked into doing an air intake below but it would have been fairly complicated running it under the poured slab. Instead it runs out the back of the stove, through the air-tight barrier, into the central porch and then to the exterior of the house. The setup is terminated with vent cap at the exterior back porch wall. In the central porch, the duct connects to a manually operated metal blast gate (used in dust collection ducting). I was told that the WAL03 is not approved for canada (different electrical requirements than in europe). The stove model that I have can be connected to air up through the bottom or the back. The back comes capped. you remove the screws and move the cap to the underside vent if you wish to provide make up air through the back of the stove. The pictures you have posted are for an earlier version of the stove. The newer version doesn't operate in the same fashion as shown in those pictures. Comment number 4 is also for an older version of the stove that assumes you are manually turning on the boiler charging set. There is now a thermostat/flussostat that comes with the stove. Once water in the jacket hits about 68C, the grundfos comes on and starts pumping. It stays on until the stove cools and the thermostat turns off the pump. The emptying tap would be for servicing purposes. Unfortunately, I didn't have room for one so we would have to close a couple of valves in the boiler room then blow the system out with pressurized air. I am not worried about legionella. The logix24 tank has a hot water coil. The coil is flash heated by the thermal mass of the tank and exits at the top at 60 C.
Photo 3 and 4 in your pictures are third party devices that come with the stove. One is just a thermostatic damper (Photo 3). As the water in the stove heats, the damper starts to close off the air flow. instructions for the installation and setting are pretty simple. Photo 4 is part of a cooling lance. It is connected to a copper rod that sits inside the heat exchanger. this is plumbed directly to your well pump/tank and is constantly under the same pressure as the domestic water. If the stove gets too hot, the valve opens and cold water goes through the copper lance and cools the heat exchanger. It comes preset. Not sure if the pump can be changed. The pump is only operating while the stove is on. the fraction of power it uses compared to the amount of energy stored in the tank during a burn is pretty small. A 3 hour burn appears to put about 20+ kWh of heat in the tank. over those 3 hours, the pump uses about 0.5kwh so its not worth the effort in getting a different pump. You could use all european fittings if you can get your hands on them...I was lucky to find dowdy seals in St. John's. 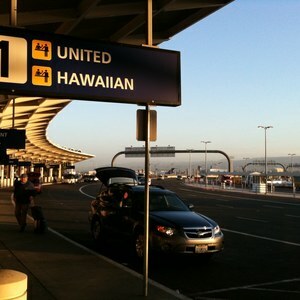 switching to an all european setup for plumbing would have lead to huge delays. I used Excel chimney by ICC. Just to clarify, the Pside kick has nothing to do with the walltherm. Its for the well pump set up. As for all the components, me and my heating guy reviewed the properties of a couple of systems. I didnt want separate zone valves (require electricity) for the system so that really narrows down how you will have to deliver heat. After reviewing some stuff by John Siegenthaler (http://www.duluthenergydesign.com/Content/Documents/GeneralInfo/PresentationMaterials/2013/Day1/hydronics-siegenthaler.pdf) it was fairly easy to put the system together. The addition of the mixing valve with the outdoor reset was to use heat more efficiently. The mixer actually mixes some return water with the supply water in order to modulate the the temperature of the supply water based on the heating demand of the building. As the temperature outside gets warmer, the rate of heat loss through the envelope is less so the water temperature delivered to the radiators is decreased. Delivering higher temperature water could lead to overheating in the shoulder seasons. Besides, moving around hot water all the time is much less efficient because the rate of heat loss through the pipes is proportional to the temperature difference between the water in the pipes and the ambient air temperature. Lower temperature systems are typically more efficient and provides more constant temperatures in a low energy home. High temperature water would lead to hot spikes in the rooms and temperature cycling. The Taco ECM pump (Veridian) pulls water through the taco mixing valve and pushes the water to the radiators through the manifolds (supply and return). 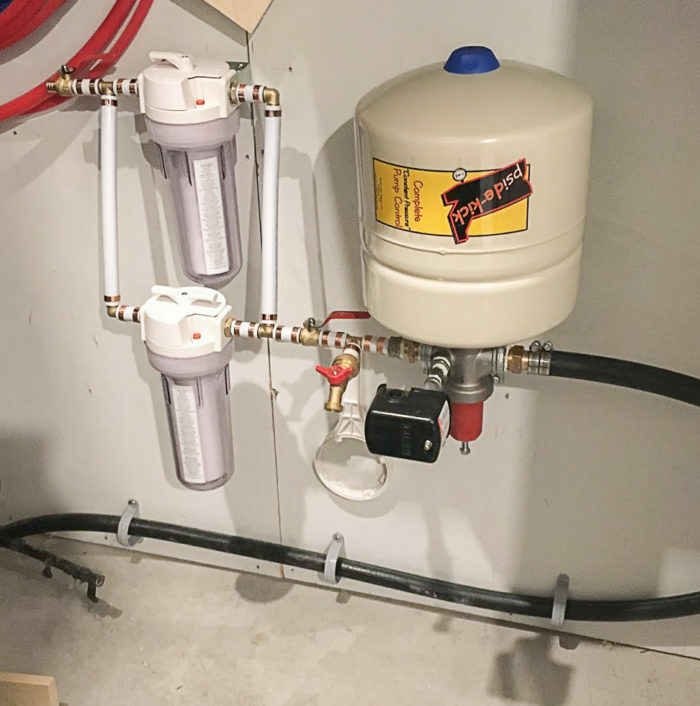 The manifold provides a way to connect all zones to the same temperature water and control the distribution with a single pump. As the TRVs open/close, the pump supplies variable flow (to maintain constant pressure). The TRVs act much like zone valves that allow water to flow/not flow based on the temperature of the room without all the electronics. As for the ball valves, etc, they are all part of adding flexibility/serviceability to the system. Good HVAC guys know their stuff and envision how the system needs to be serviced as the system is bing designed. Every install is different so every install is a custom design. I also meant to add a few comments about the tank. I had a diagram but knew little about the configuration of the connections on the tank. 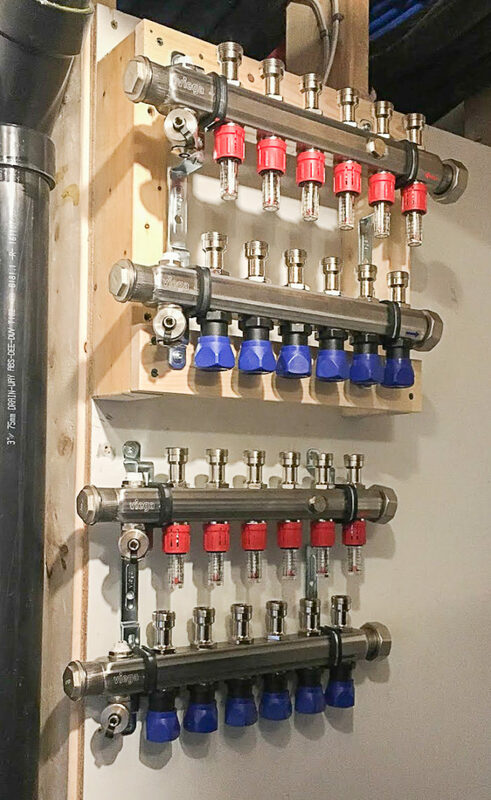 The stubs for connecting the pipes are organized in quadrants. So putting the tank in a corner, which was the original plan made it impossible to use a lot of the stubs. . It would have been impossible to use alt least half of useful ones for my application. With the ERV vent already in place there were very few places that the ERV could go. Having it on an exterior wall makes sense from an energy perspective but we had to move it. If I moved the tank I was going to have to move everything. So that's what we did....it took many sleepless nights figuring out that final layout. Hi David, thanks for all the information. I guess the model of Walltherm you bought was the Konigspitze? My cabin is only 525 sq' and while I don't plan on having in-floor heating I am considering adding a hot water radiator to the bathroom, either the brand you bought or possibly a Runtal Omnipanel. Do the radiators have to be low temperature types or can any radiator work? Also, would I need a zone manifold if there is only one radiator? How many zones do you have? I guess the TRV on each radiator sends a signal that the room is getting too cool? I must admit that the system seems a little complicated. Have you created a master list of all the steps you have to do to fire up the heater each time, what to do to shut the system down for the summer and start it up again in the fall? 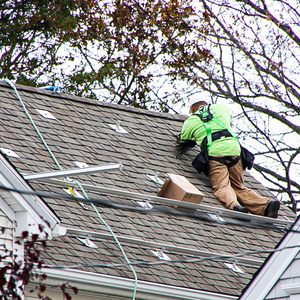 Do you plan on adding their solar panel system in the future? How are you heating DHW in the summer? On a different topic, I was reading one of Joseph Lstiburek's articles on range hoods and he said that in any tightly sealed house a make-up air device must be installed and connected to the range hood unit so that it comes on automatically. Did you install one? I'm considering a range hood from Broan and also using one of their make-up air devices. Walltherm also says that range hoods can interfere with the combustion in the stove. There are radiators designed specifically for low temperture applications. For example Jaga makes some. Their low temperature radiators are really nice but were outside my budget. Any panel style radiator will do but need to be sized based on the manufacturers output tables. Most manufacturers provide BTU/hr based on GPM flow and water temperature. As long as you have a heat load for the room, you can size the radiator. Keep in mind that low temperature rads typically have alot of internal surface area while most panel radiators do not. They aren't as efficient at dispersing heat as a low temperature rad. Therefore most panel rads will be bigger than a low temperature rad in order to achieve the same BTU/hr. The softline radiators by Stelrad are the ones that I used. Here are the output specs (https://www.expressradiant.ca/pdfs/product_compact.pdf). I have 12 zones. each radiator has it's own connection. One to the supply manifold and another to the return manifold. Each radiator has a TRV. Controlling temperature is simple. There are no signals or electronics involved in the call for heating. Ill try my best to describe. A TRV is a simple device. No electronics or signal involved at all. It is a thermo mechanical device. As temperature in a room changes, wax inside the TRV expands/contracts which actuates a linear valve that opens/closes and allows water to flow/not flow to the radiator. A pump supplies constant pressure to the supply manifold. As TRVs open, water flows through their common supply manifold and onwards to the radiator whose TRVs are open. The only thing electronic is the pump but its always on. The pump maintains pressure regardless of open or closed zones. If the zones are all closed, the pump "dead heads". meaning its impellar is spinning but only enough to provide the set amount of "head" pressure. As a room heats, the TRV closes naturally due to the temperature response of the wax inside. 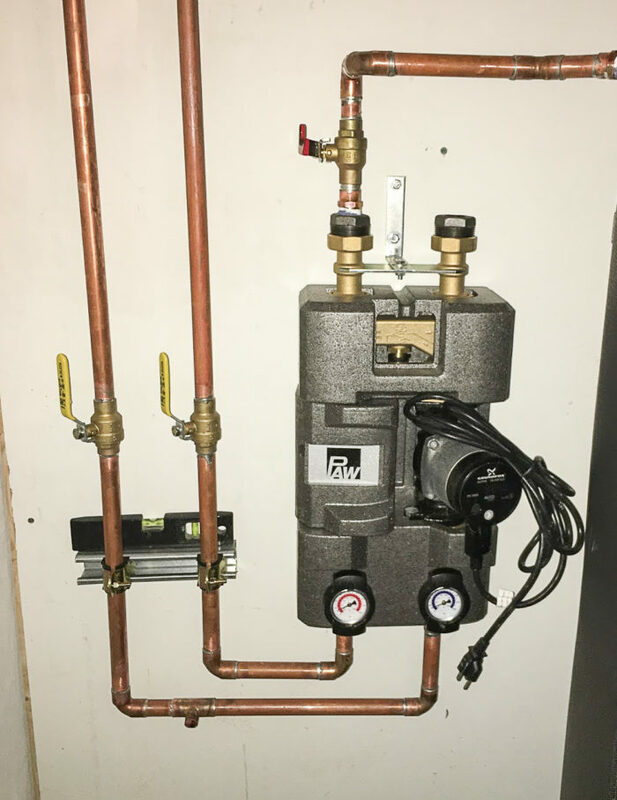 It seemed complicated at first because I had no experience with hydronics. Now that i understand how the system works, it is probably one of the most simplest systems. As long as there is a heat source for the tank, the whole distribution (12 zones) operates from a simple mixing valve and a single pump amounting to around 30 W. There are no electronic zone valves, electronic thermostats, timers, heating schedules, etc. I just set the TRV and it modulates heat according to the room heat loss. There is not really a master list to start up the stove once you commission it. The boiler charging set is hooked directly to the stove thermostat. There are some tricks to building a good base for your fire but everything else is automatic. You light the stove, once the flue temp hits 300-400F you switch to gasification mode. Once the temperature of the exchanger gets to 68C, the charging set comes on and starts pumping. THere is very little intervention unless the gasification flame breaks down. Then you redistribute the coal bed, close the door and pull the gasificaiton lever again. It all sounds complicated but its not that different than a normal stove. for the summer you just have to clean the stove, test the pump once per month. Since I wanted to use the logix for DHW (using internal coil) I needed a way to heat the tank during the summer. I installed a couple of 4500 W elements that are controlled by a control circuit. In the summer I'll flip a switch and the function of the lower element will be replaced by a Nyle Geyser R using the logix 24 solar exchanger. I will not be adding solar thermal. I do not have a range hood. I have a over the range microwave that captures some odour. The kitchen has a larger 6" diffuser and continiously removes 35CFM from that area. I set the ERV on turbo when we are cooking and it removes more. I can tell you that even a unbalanced ERV can interfere with the stove in an air-tight house....but thats in another post! So do you use the stove at all in the summer or do you just clean it at the end of the heating season and drain the radiators (while leaving the DHW operating)? 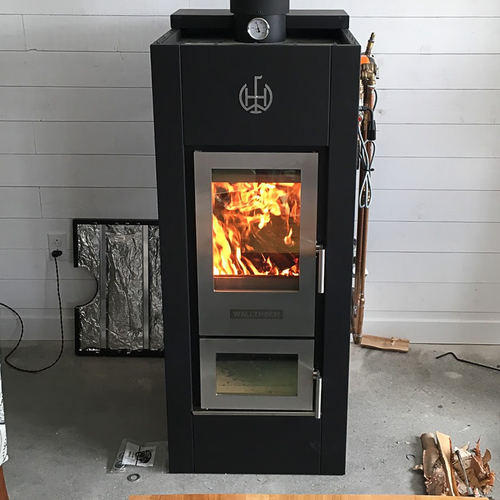 Since the Canadian supplier of Walltherm stoves is in Nova Scotia did anyone from the company come up to help with the install? Did they suggest any of the devices you added on to the system or did you find them on your own? How long did it take for all the Walltherm equipment to come in? Its likely that heating season is almost at an end here in Newfoundland. For summer, the stove will be cleaned according to the manufacturers recommendations. The radiators will just be left as is. No Draining required. Nobody from the company came, any HVAC person that works with boilers wouldn't have a problem with installing the stove. Roland helped us along the way with phone support and some email support. Once the equipment shipped, it took about a week...but cape breton is just a hop skip and a jump from Newfoundland. 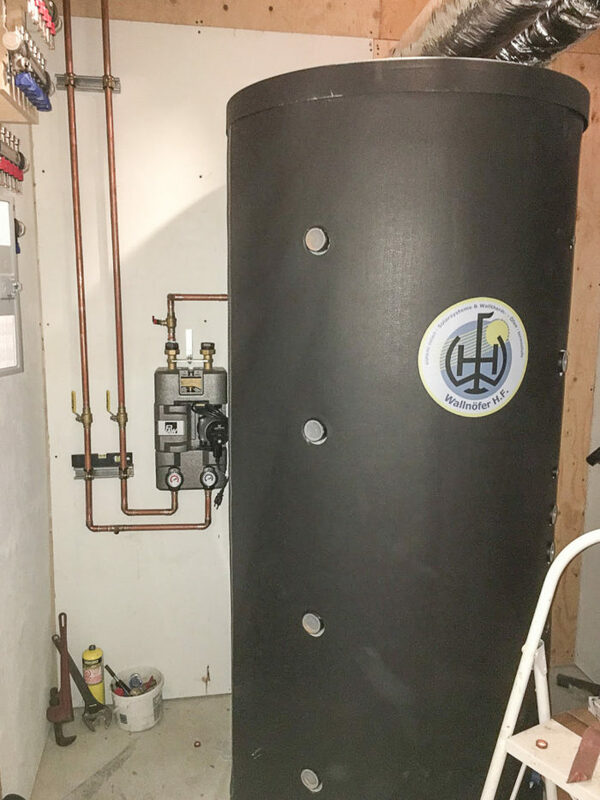 Hi David, in reading through the presentation from Deluth Energy Design I noticed that one of the recommendations he makes was that a buffer tank be included in a hydronic system. Since you have so many heating zones, as well as DHW, I was wondering why you didn't include one in your system? 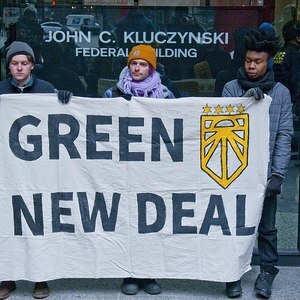 Also ,since you opted to not include solar PV for now and in the future, I was wondering how you would power your system in the event the east coast gets hit with another ice storm and the power goes out for a couple of weeks? Tank would receive about 30kwh. This is enough to heat the house and provide hot water for a day and a bit. Using another buffer would allow more heat storage but burning the stove longer would lead to a pretty uncomfortable space. Everything sounds very "well" designed (pun intended). What equipment are you using to get the water out of the well, clean and purify it. store it and then move it into the Walltherm system? Do you have a back-up generator in case you lose power for days or weeks? The psidekick csv is being used with a 3/4 hp pump. The well is drilled into bedrock at about 300 feet deep. The 3rd picture in the blog post shows the setup. Other than a nuisance sediment filter, no purification needed. There are two inputs to the tank, one for domestic hot water, one for the logix refill. A waterline is also plumbed directly to the stove to a safety switch. I also forgot to mention that I have a generator subpanel in the house. My heating system pumps, refrigerator, hrv, some lights/plugs, and pumps for the heating system are on that panel. My plan is to purchase a generator. I'm curious about how your mechanical system might be reviewed by Martin Holladay (who is, as you know, a famous off-gridder). The reason I ask is because your entire mechanical system is dependent on grid energy. In a severe weather event. you might be isolated for weeks in a freezing cold house with no way of manning the pumps. In addition to a generator, have you considered adding something like a direct vent propane wall heater that would automatically switch on in an emergency? Maybe once the indoor temperature falls below a certain set point? I see no reason to give David Goodyear's heating system a negative review, as you imply I should. Almost every heating system in America, whether we are talking about a furnace, boiler, or heat pump, stops working when there is a power outage. Really? You think I'm implying that you should give David's heating system a negative review? I'm just curious as to what you would suggest to supplement it in case of a major power outage ala the ice storm that hit North America in 1998. Since you have lived "off grid" for almost 40 years I'm sure you have the experience and wisdom of knowing what to do when a system stops working. David's entire heating system runs on electricity. If it should not be available for several days (or weeks) what can he add to his home to make sure that everything remains habitable. Geez, if you don't want to answer the question, don't respond, but please stop inferring that people have ulterior motives in asking the question.. Your question would have been clearer (and easier for me to understand) if it had been posed as a general question -- "What type of heating system works when there is no electrical power available?" -- rather than a question focused on David Goodyear's system. The two usual methods used to heat a house that has no electricity are (a) an old-fashioned wood stove or (b) a propane-fired space heater with through-the-wall venting. If you choose (b), make sure that you purchase a model that doesn't require electricity. I feel like I am in a much better position than most. First of all, living in a Passive house which requires very little heat puts us in a good position for grid downtime. My system requires about 40W. Most have a heating system requires many kW. My primary heating system is also my emergency heating system. The stove itself requires no electectricty. The stove is purely natural draft unlike a furnace but it still pumps out 2.5 kW to the space and 12.5 to heating the tank as long as I can pump the water. A small 1500 W inverter generator should be all I need for the whole house as long as I am careful with loading. The stove can be operated without the pump although not recommended. lighting a small fire is possible. one just needs to make sure that the temperature of the water stays low. It is likely that it will take a long time for the house to reach freezing/uncomfortable temperatures. In my previous home the temperature dropped to 4C within a 3 day period if the power was off. I don't expect the same in this house. I am more concerned with keeping food from spoiling than comfort....thats why Im concentrating my efforts on a root cellar. I’ve got to ask… what’s wrong with building a smaller fire in that big stove? Wood burners put out a lot of particulate emissions. The emissions go down as the temperature of the stove goes up, and can be VERY high for smaller fires where the stove never comes up to temp. With most wood stove designs you don't get more than about a 3:1 turn down from the fully-rated BTU before emissions start going way up, and combustion efficiency way down. It's better for both emissions and raw combustion efficiency to run fully hot but intermittent fires than to build only small fires. Dana got to the answer before me! Sorry about that! Thanks Dana!